Keeping with the New Year’s theme of lighter and healthier dishes, I have a great one for you today. 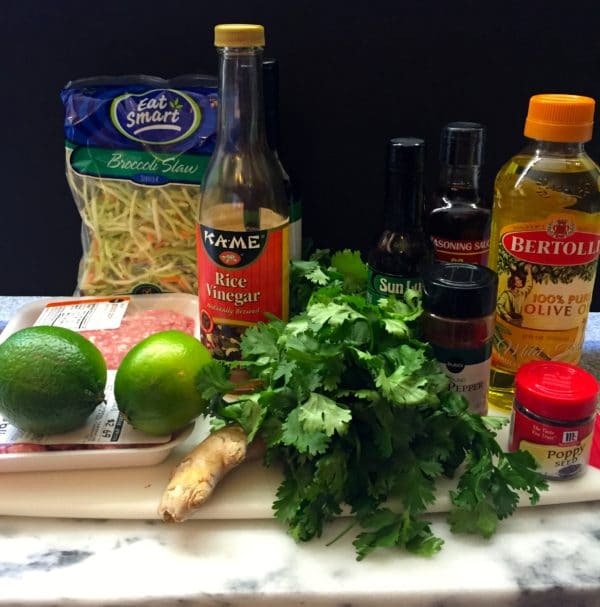 How about my fresh and Healthy Thai Pork with Asian Slaw? Fresh Healthy Thai Pork with Asian Slaw is a delicious and low-calorie meal, with a full serving coming in at only 218 calories. This tasty entree is also full of nutrients and vitamins, and if that isn’t good enough, you can also make it ahead. In reality, it only takes 30 minutes tops to prepare, but if your evening is going to be hectic, why not make it in the morning and it will be ready and waiting for you when you get home. Or, it’s great for lunch too! I know what some of you are thinking; what in the world is a blog, which features food with a southern flair doing with recipes for Thai food? Well, every once in a while I like to mix things up a bit to keep my husband on his toes, and I wanted to bring you some low-calorie choices this month. If your New Year’s resolution is to lose weight, I have you covered! Also, I know dieting is hard, and I hope a few delicious low-calorie choices for meals might make it a little easier for us all to lose that extra weight from the holidays. The ingredient list for fresh and Healthy Thai Pork with Asian Slaw is a little daunting, but don’t let that deter you. You just sauté the pork and mix everything else together. One ingredient, however, might give you pause and that is fish sauce. If you have never used it, you are in for a treat because it gives a great depth of flavor to the pork. But there is one cardinal rule with fish sauce, do not, under any circumstances smell it! Just add it to the dish and put the cap back on. Please, trust me on this one. You can find fish sauce in the Asian section of your grocery store. The ingredients for Thai Pork with Asian Slaw are ground pork, fresh cilantro, lime juice, mint leaves, brown sugar, fish sauce, scallions or green onions, fresh ginger (you could substitute ground ginger), sesame oil, ground red pepper, rice vinegar, lite soy sauce, olive oil and a package of broccoli slaw. Drain the pork on a paper towel and allow to cool. 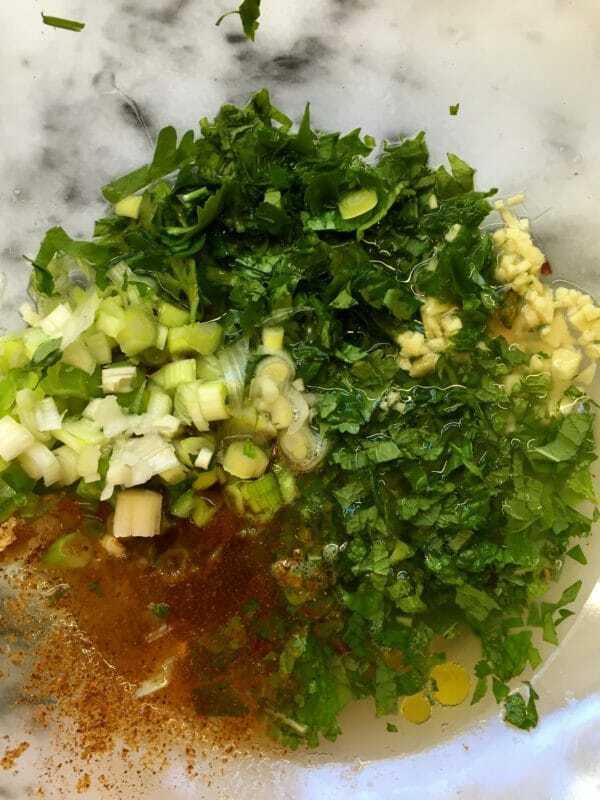 Add the cilantro, mint, lime juice, brown sugar, fish sauce, onions, ginger, sesame oil and ground red pepper to a medium size bowl and combine. Add the pork and combine. 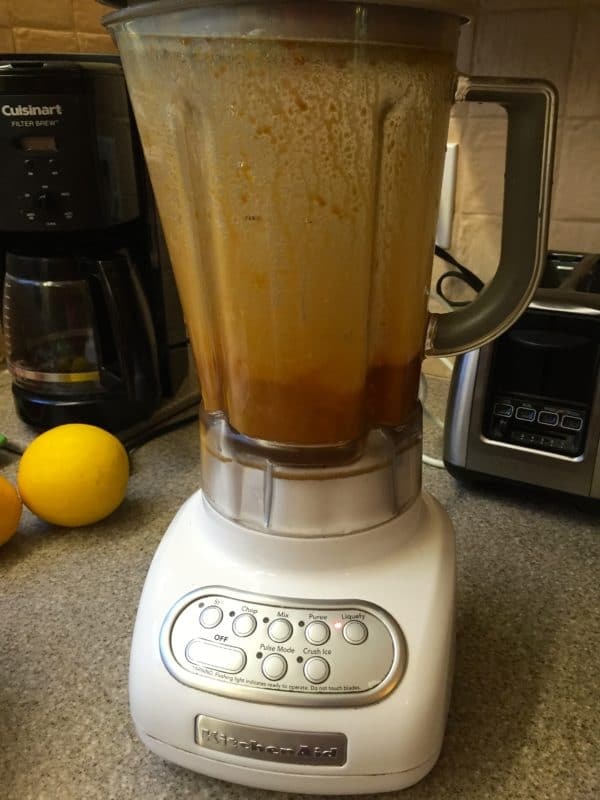 Add the rice vinegar, soy sauce, brown sugar, and olive oil to a small bowl and mix well, or add everything to a blender and process until combined. Drizzle the dressing over the broccoli slaw and top with the pork mixture. Serve immediately. Note: If you are making ahead, cover and refrigerate the cooked pork mixture and dressing. When ready to serve drizzle the dressing over the broccoli slaw and top with the pork mixture. If you like this recipe, you also might want to check out my Chicken Lettuce Wraps! Chicken Lettuce Wraps is another low-calorie, quick and delicious Asian inspired meal. 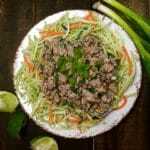 Fresh Healthy Thai Pork with Asian Slaw is a delicious, quick, healthy and low-calorie meal, packed with vitamins, coming in at only 218 calories per serving. 1/2 cup fresh lime juice **Please note, the lime juice was inadvertently omitted from the original post. Add the cilantro, mint, lime juice, brown sugar, fish sauce, onions, ginger, sesame oil and ground red pepper to a medium size bowl and combine. Add the pork, combine and set aside. **January 26, 2017, Recipe updated: Please note the addition of 1/2 cup lime juice to the ingredients which were inadvertently omitted in the original recipe post. 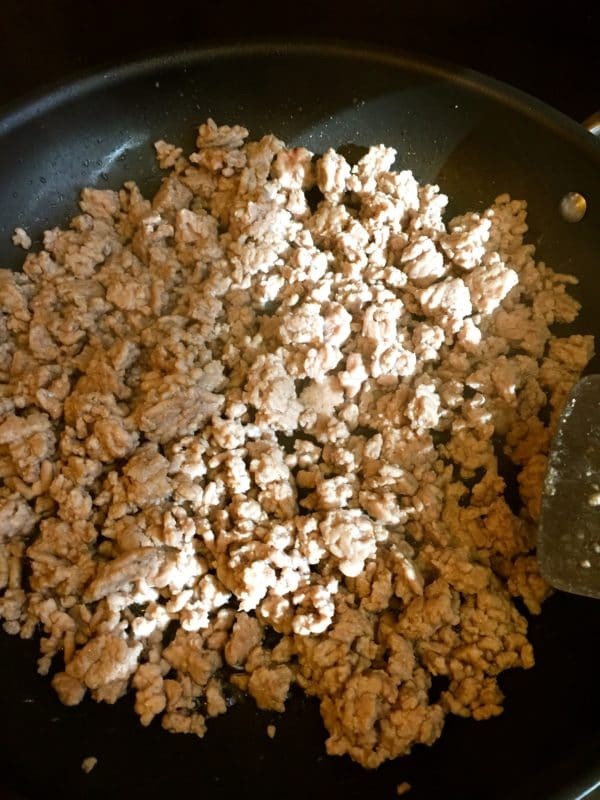 If you are making ahead, cover and refrigerate the cooked pork mixture and dressing. When ready to serve drizzle the dressing over the broccoli slaw and top with the pork mixture. This looks and sounds so delicious. I love a healthy meal that is super filling and this seems to fit the bill! This looks super easy and really delicious! I also love the slaw and that it’s low carb and healthy! Can’t wait to try it! This looks amazing!! I love Thai flavors and this is so much healthier than my local Thai takeout place. Thanks for sharing! Love all the flavors in this especially the dressing for the slaw. I love zingy Asian flavours and this looks so fresh and healthy!